We Won! 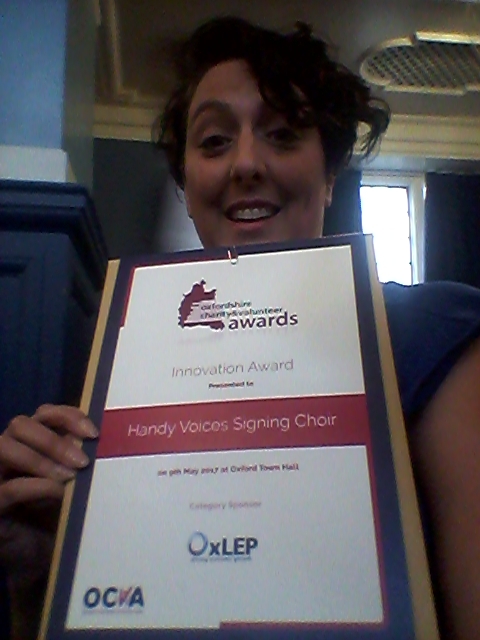 Innovation Award awarded to Handy Voices against huge competition! 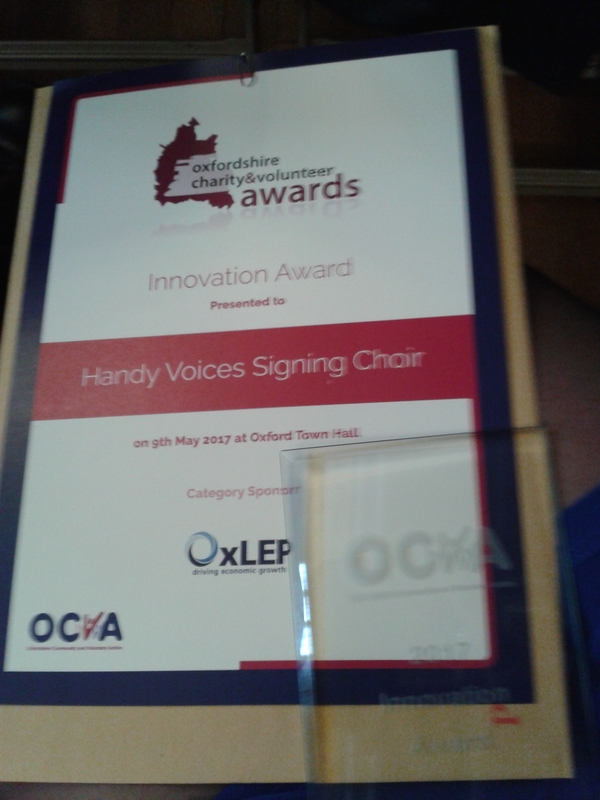 Last night, Tuesday 9 May 2017, Handy Voices Signing Choir was invited to the Oxford Charity and Volunteer Action Awards. I was there with my husband, Rand Russell to represent the team. We were shortlisted for 2 categories, Best New Group and Innovation. It was lovely to be in the Town Hall with about 300 people watching, hearing about our achievements from the speaker and seeing our names on the big screen, but then they called our name and I was so shocked and surprised. It was a great moment. So proud of all that Handy Voices has achieved since our inception in September 2014 when we were partnered with SongScope and then breaking out on our own from June 2015. Since that time we have gone from strength to strength and have started to make a difference in the local community. Long may that continue! 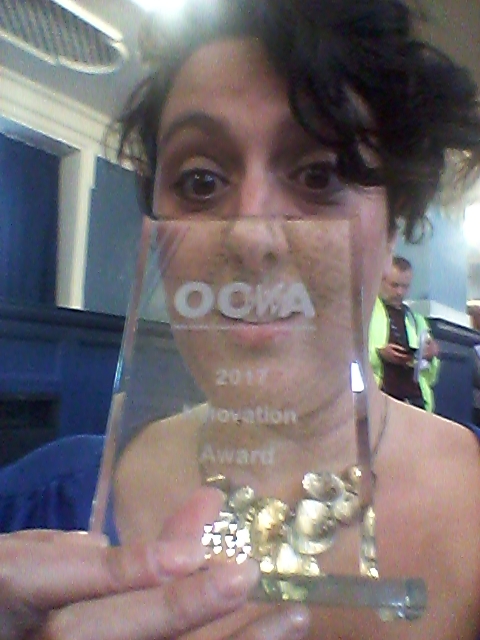 Official photos to be put up soon, but here are a few selfies of me with the award from last night! 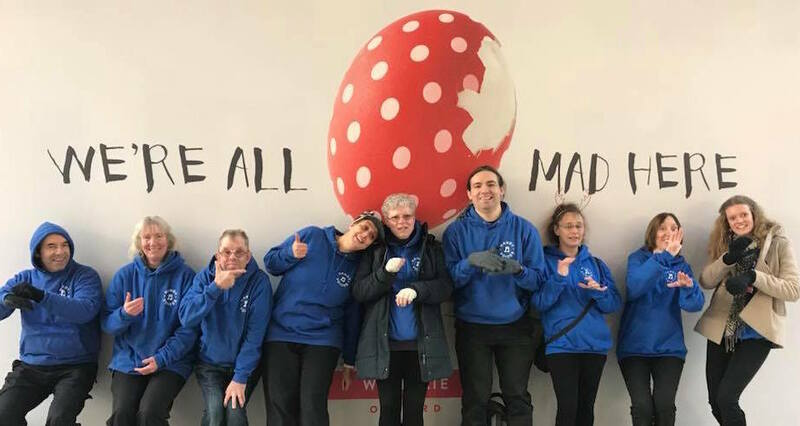 Handy Voices has been invited to attend the Oxfordshire Charity and Volunteer Awards as it has been nominated for an award in two categories: Best new group and Innovation. Christine DeBlase, our choir leader will represent Handy Voices at the Award Ceremony held in the Oxford Town Hall on Tuesday 9 May 2017. Pictures of the event will be posted as soon as possible. Wish us luck! BREAKING NEWS! HV has a new venue! Moving to Oxford Deaf and HOH Centre! Yes it is has happened! Handy Voices has moved its operations to Oxfordshire’s hub for the D/deaf community, the beautiful and historic Oxford Deaf and Hard of Hearing Centre. This centre has been in Oxford and working with the Deaf community for over 60 years and to help with our outreach, our vision and our growth, our move here was timely. Google map to venue: HERE Look forward to welcoming you there! Jersey Eisteddfod is coming up! Handy Voices is getting very excited as we have 6 entries in this year’s Jersey Eisteddfod (the world’s largest sign singing competition)held in St Helier, Jersey on 5 November 2016. We have been very brave and this is the first year that we have entered as Handy Voices Signing Choir into the competition with two duets, two solos and two small group pieces. It is very exciting and wish us the luck! We are really looking forward to it!